Documentation is an important aspect to any software project. LF-Releng provides some recommended tools for projects to get setup with their own documentation and we will attempt to describe them in this guide. The main tools recommended to generate docs is Sphinx and reStructuredText. Sphinx is a tool for generating documentation from a set of reStructuredText documents. LF provides lfdocs-conf as a convenience package that will pull in the most common documentation dependencies and configuration for your project. global-jjb provides job templates that can build and publish the documentation. Typically every project like ONAP, OpenDaylight, OPNFV, etc… have a “documentation” project. 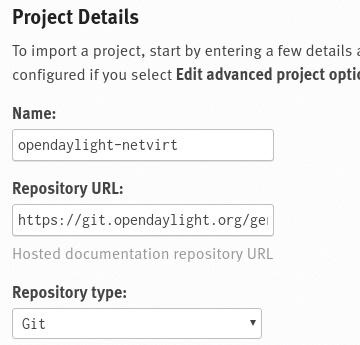 This project provides a gateway to all documentation for the project and typically is the index page of any project’s https://docs.example.org url. Linking between projects are possible via intersphinx linking. Bootstrap your project with documentation by following these steps. Setup lfdocs-conf with the Install Procedures. Open a Helpdesk ticket if you require assistence here. Follow the steps described in the rtd-jobs documentation then record the rtd-build-url and rtd-token for the next step. Project name in Gerrit converting forward slashes (/) to dashes (-). Project name as defined in Gerrit. More details on rtd job template configuration and parameters is available here. If lfdocs-conf patches are already merged then issue a ‘remerge’ so the publish job can push the docs to ReadTheDocs. In this task we will add a project to ReadTheDocs. This is necessary to let ReadTheDocs know where to pull your docs to build from. Remember to add lf-rtd as a maintainer of the project. This is to ensure that LF staff can continue to manage this project even if the project owner stops working on the project. If you would like helpdesk to assist with creating the project for you then open a helpdesk ticket. Remember this name to setup the Jenkins jobs. Either the main documentation project’s committers or LF Staff will need to perform this step. If documentation project committers are not available contact the Helpdesk to have LF Staff take care of the subproject configuration. Typically the repo name. Forward slashes are not allowed so convert them to hyphens. When working with related projects that generate separate Sphinx documentation that need to be cross referenced, intersphinx linking is the recommended way to link them. As a refresher, refer to the Sphinx documentation on linking and review the upstream docs for the :doc: and :ref: link types. :any: is a useful helper function to let Sphinx guess if a link is a :doc: or a :ref: link. In most cases folks use these link references to link to local documentation, we can use these for intersphinx linking to another project’s public docs as well via a namespace and configuration in conf.py. The configuration is a dictionary containing a key which we will refer to as a doc namespace and a tuple with a link to the project’s public documentation. This namespace is locally significant and is a free form word so set it to anything, then within the local project use it to reference an external doc. The lfdocs-conf project already provides common LF docs related intersphinx links for projects using lfdocs-conf. Since lfdocs-conf defines the intersphinx_mapping dictionary, the code above will append to it using a key-value pair. More examples of intersphinx mapping exist in the OpenDaylight conf.py. Using the namespace we can refer to docs and labels in external project documentation in the same way we can refer to local documentation. From the example, we insert the global-jjb docs namespace as deliminated by the colon : symbol inside of link reference to point Sphinx to the global-jjb project docs link. The above example highlights a bad practice in some LF Docs projects where we were namespacing label definitions using code such as .. _lf-global-jjb-jenkins-cfg-merge. This is redundant and unnecessary as the project is already namespaced by the intersphinx_mapping configuration. When defining labels, define them with locally significant names and use intersphinx_mapping to handle the namespace. Every Sphinx build produces an objects.inv. In a local build this file is where the html output is for example docs/_build/html/objects.inv, online the file is at the html root https://docs.releng.linuxfoundation.org/en/latest/objects.inv. We can use this file to inspect the types of reference links we can use for a project. Links listed as std:doc refer to the :doc: syntax while links listed as std:label refer to the :ref: syntax.